Cheshires Way, Lawley Village, Telford, Shropshire. OFFERING VERSATILE ACCOMMODATION: A beautifully appointed three storey family home. Through Hallway, Cloaks/WC, Open Plan Kitchen/Diner, Receptions Room, 4 / 5 Bedrooms, Family Bathroom, 2 En-Suites, Garage, Gated Driveway, Enclosed Garden, EPC Rating: B.
Lawley Village is pleasantly situated on the western edge of Telford just under 2 miles from Telford town centre with its wide range of recreational and shopping facilities, including the New Southwater development, the M54 motorway and the town’s central railway station. Lawley Village itself incorporates a supermarket, a number of smaller retailers, doctor’s surgery and two primary schools. The World Heritage Site at historic Ironbridge is a little over 4 miles to the south. The Horsehay Golf Course is also located nearby. Offers flexible accommodation built by Messrs ‘Persimmon Homes’ to the ‘Tulip’ design. The generous proportioned accommodation comprises an entrance hallway which has a staircase ascending to the first floor, access cloakroom/wc, open plan kitchen/diner and lounge. The open plan kitchen/diner has a range of base and wall units, tiled splash backs, integrated oven and hob with extractor hood over, space for further appliances, breakfast bar and patio doors in the dining area leading to the enclosed garden. The lounge has a dual aspect creating a lovely light and airy feel - one via a bay window. On the first floor there is a landing area with access to two / three bedrooms and family bathroom. The family bathroom has a white suite comprising the usual facilities. On the second floor there are two further bedrooms. The master bedroom has fitted wardrobes, double opening doors to a Juliette balcony and an en-suite shower room. The guest bedroom also has the benefit of an en-suite shower room. The enclosed garden has a lawn area, paved patio and gravelled area. To the side of the property there is a secure gated driveway giving access to the garage. 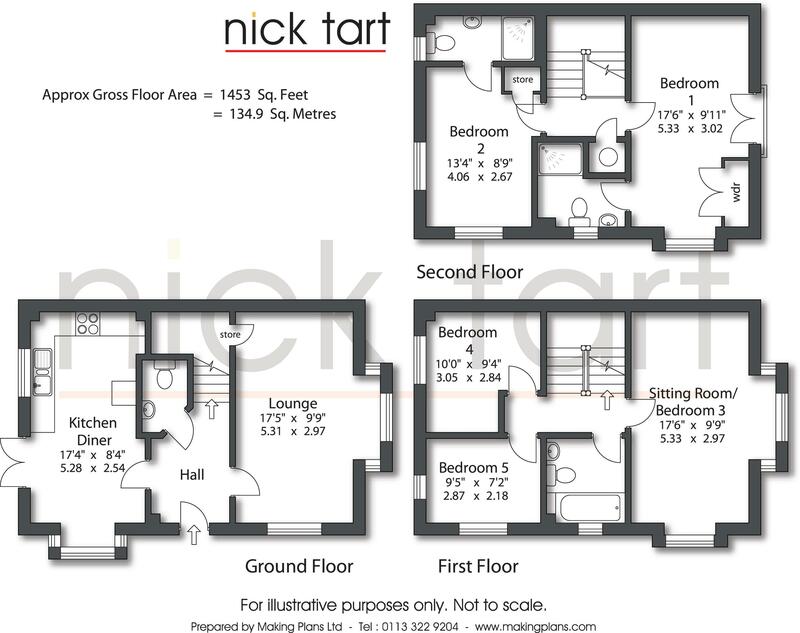 How to get there – for sat nav use postcode TF3 5GX to Cheshires Way where the property is indicated by a Nick Tart for sale board. Tenure – we are advised the property is Freehold. There is a service/management charge payable to Bournville Village Trust (approximately £216.36 per annum – April 2019). .